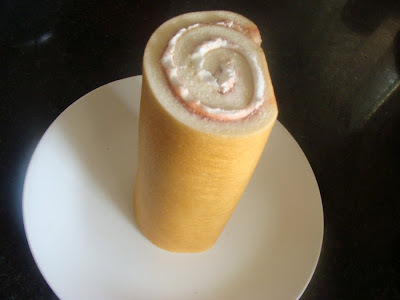 Open canned cinnamon rolls and separate into individual rolls. Take one individual roll and unroll it to full length. Fold full length of dough in half. Twist (or braid) rope and place on cooking pan. Twist (or braid) second rope and place on the cooking pan end-to-end with the first rope. Continue adding twisted sections of dough until you have made a complete circle. Using your hands, gently move circle of dough into an oval for a more traditional King Cake shape. 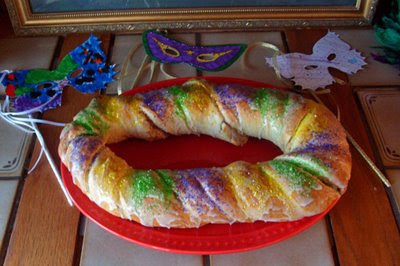 Place King Cake into 375 degree oven for 15-20 minutes or until golden brown. Remove King Cake from oven when it is nice and golden brown. Before the King Cake begins to cool, spoon a generous amount of icing over the top and sides. Immediately after icing your King Cake, sprinkle the icing with a combination of the purple, gold, and green crystal sprinkles. 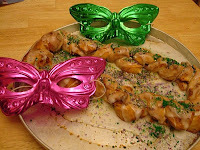 Note: You could also use this recipe to make mini king cakes! Follow the directions above, but instead of connecting each of the individual cinnamon rolls together, form the twisted (or braided) roll into a small circle pinching the ends to close. Also, be sure to place the "cakes" far enough apart so that they do not touch on a greased cookie sheet or baking pan. Tomorrow is Shrove Tuesday, also known as Fat Tuesday, Mardi Gras or Pancake Day. It is the last day of an unofficial period called "Carnival" which began after Epiphany. A well know celebration of "Carnival" (which comes from the Latin word carnelevare meaning "taking away of the flesh") is the famous Mardi Gras in New Orleans. The traditional dessert for the day is a King Cake. King Cakes are made of a cinnamon filled dough, and baked in an oval shape. 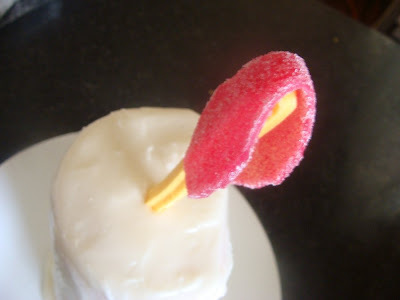 The cake is topped with a delicious glaze and then sprinkled with colored sugar. The three colors of the sugar are Purple, Green, and Gold (representing Justice, Faith, and Power). A plastic baby (a gold coin may be used as well) is baked inside the King Cake, and the tradition is whoever receives the baby in their piece of cake must buy the next King Cake or throw the next party. 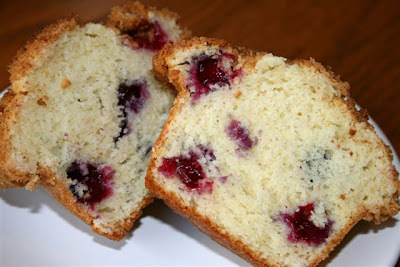 The following recipe and photo was shared by Melissa on her lovely blog Bountiful Blessings. Thank you Melissa! Any leftovers could be placed in the freezer to be served on Laetare Sunday as a foretaste of Easter! I've now made this dish for two Ash Wednesdays. It's the perfect start for the beginning of Lent. I found this recipe in Celebrating the Faith: Lent and Easter in the Christian Kitchen by Laurie Navar Gill and Teresa Zepeda, printed by Emmanuel Books (I highly recommend the whole series). Mrs. Gill’s reasoning behind this dish: “This is a tasty dish, but in my opinion, canned black beans with their purplish liquid are fitting for this day of sackcloth and ashes.” She even slips a tiny teaspoon of ashes from the burned palms after it is all cooked. It doesn’t change the taste, but provides another Lenten reminder. I highly recommend this cookbook, especially if have special food needs and can’t seem to find inspiring meatless meals that don’t incorporate cheese (or wheat or eggs). But the cookbook has more than abstinent menuse. There are also other Lenten ideas, bread recipes, Holy Week and Easter Season recipes. In a family size skillet, heat olive oil and then saute carrots for 3 minutes. Add peppers, onions, garlic, celery, picante sauce or salsa, water or stock, and spices, mix together and cover. Depending on liquid amount and desire of flavor, add 1/4 cup or so of white wine for flavor. Cook for 15 minutes. Drain and rinse beans, add to skillet, cook 5 more minutes. Serve over rice and/or in taco shells with a salad. The Tuesday before Ash Wednesday is known as Shrove Tuesday, or "Pancake Tuesday" because traditionally, fats, eggs, and butter in the house had to be given up for Lent, and pancakes, or waffles call for all these ingredients, so this was a great way to use them up before Lent began. The money not spent on dairy products was then collected and donated to the church. 1) In a small bowl, combine the flour, sugar, baking powder and salt. Combine the egg, milk, vanilla and softened butter; stir into dry ingredients just until moistened. St. Valentine's day is a commercial dream, with its greeting cards and chocolates and big sparkly gifts for those you love. I'm not one to shun any reason for chocolate consumption! But, in celebrating this Feast in my home, I wanted to show the children that St. Valentine was not the patron saint of chocolate consumers, but rather a martyr who would offer his life out of love for Our Lord. This was the connection I wanted to make to St. Valentine's day. Tradition holds that there are actually three martyrs named Valentine associated with February 14, Valentine of Rome, Valentine of Terni (whom some scholars believe to be the same person as Valentine of Rome) and another Valentine of Africa of whom not much is known. One thing is certain about all three of these men, they died out of heroic love for Our Lord and His Church. There are differing traditionally held beliefs associating St. Valentine's feast with that of romantic love. Some believe that it was an attempt to "baptize" a pagan ancient Athenian celebration of the god Zeus and Hera's marriage. Others tie the the day to an ancient Roman feast that had tones of romance called Lupercalia, which took place on February 15. Another connection is made through the observation that birds naturally choose their mates in the second week of the second month - February 14. For the Feast, I wanted to tie in the connection to the martyrdom St. Valentine underwent. The most traditionally held story is that St. Valentine was a priest, and possibly a bishop around the middle of the 3rd century. He was imprisoned for his faith and refused to convert to the pagan religion. While imprisoned, he converted one of his jailers and stories relate that he cured the jailer's daughter of blindness writing to her the very first valentine, a note that said simply, "From your Valentine." Red is the color that is symbolic of martyred saints, and also of love. The vestments worn today (for those Masses following the traditional Church calendar **see note below**) are red. My meal tonight would be red in honor of the martyr and his heroic love! The fish should be flaky. Let the dish stand covered for 5 minutes. Serve over rice. This recipe is originally from a cookbook entitled, "Tony Chacheres Microwave Cajun Country Cooking". It is no longer in print. Rinse potatoes, but leave skins on. Cut potatoes into bite size pieces and add to a large bowl. Drizzle generously with olive oil. Sprinkle chives, salt, and pepper over potatotes. Toss to cover all potatoes. Arrange in a single layer on a baking sheet. Bake at 425 degrees for 45-50 minutes or until potatoes are fork tender, tossing potatoes once or twice to ensure even browning. ...and for tonight, we're having some of Charlotte's incredibly addictive and sweet Valentine Dots. I hope it's ok with Charlotte if I share her delicious Valentine treat with you! Set the oven to 200 degrees. Place a sheet of parchment paper on a baking sheet. Arrange the pretzels in a single layer and add a Hershey's kiss on top of each pretzel. Place them in the warm oven. Let them bake for about 8 minutes. The plain chocolate Kisses won't melt completely, they'll get shiny. The white chocolate Kisses will melt quickly. Remove from oven and press an M&M in the top of each soft Kiss. Let them cool and enjoy! 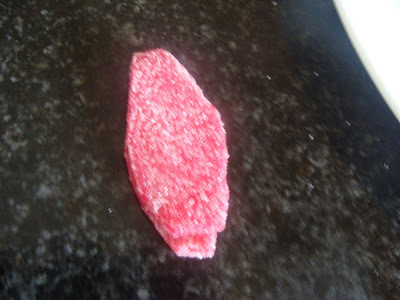 I must warn you, these are extremely addictive! May your St. Valentine's day be filled with a heroic love for Our Lord! Valentine's Day is fast approaching and if you are like me, it might just be sneaking up on you a little too quickly! 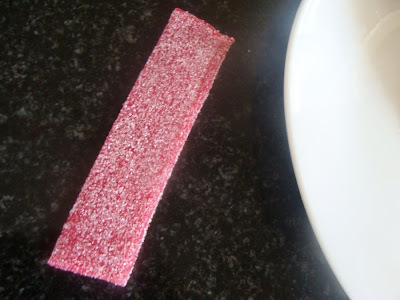 This is a real simple and yummy treat you can give your family on Valentine's morning. While the syrup is cooking you can cook your French toast, using your cookie cutter in the shape of a heart! If you aren't worries about calories, either, top it with some homemade whip cream. This is a syrup I have been making and tweaking for years. It is finally right where we like it. It is great for those who are trying to watch their sugar intake, as it does have nearly the amount of sugar as regular syrup! 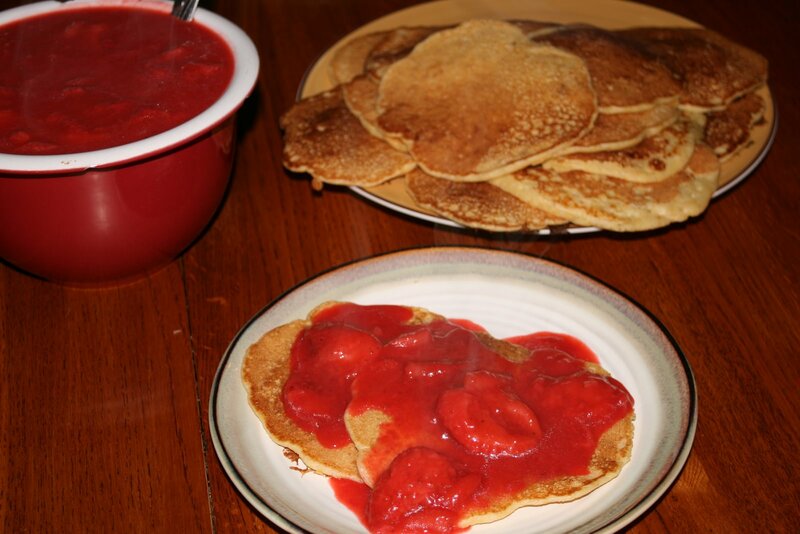 Cook strawberries, butter, and powdered sugar (use powdered instead of regular sugar as this will help thicken the syrup) in large pot for 3-5 minutes on high stirring constantly, until all butter melts and syrup starts to form. 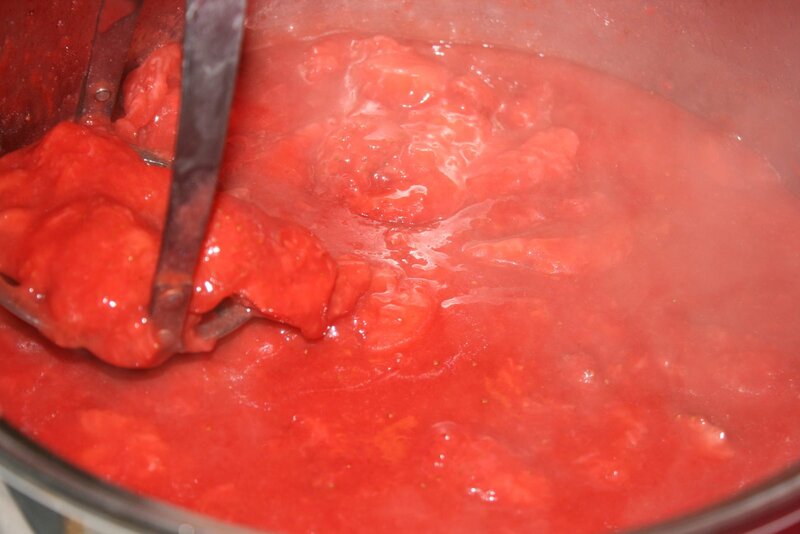 Turn heat to medium-high, stirring only occasionally, until all the strawberries are cooked through. 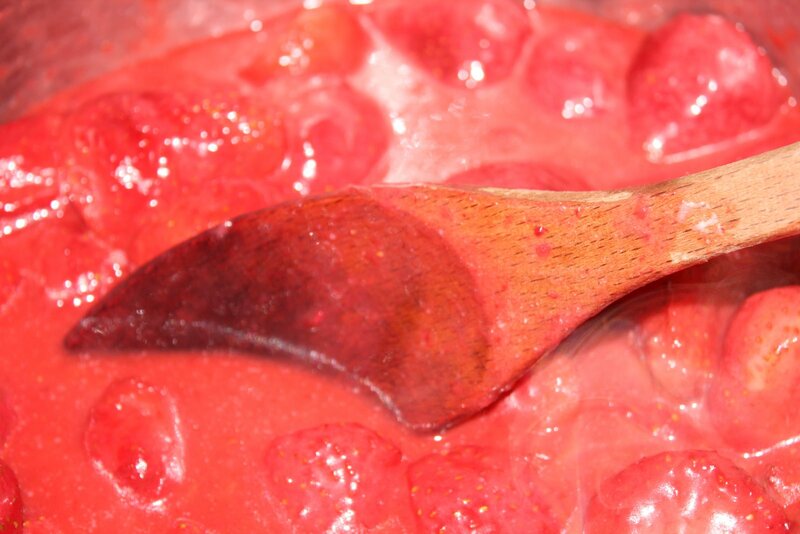 Then take a potato masher and mash the strawberries to your hearts content (depending on how chunky you want it!). This syrup is great on pancakes, crepes, French toast, or your favorite breakfast treat! Hey, it is probably great on ice cream too! 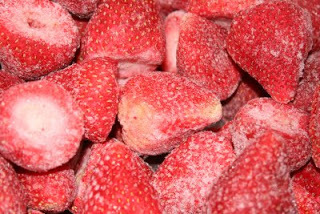 You can substitute any frozen fruit for the strawberries, such as blueberries in honor of Our Lady of Lourdes! You just may not want to mash berries such as blueberries, raspberries, or blackberries. I apologize for the fact that I am posting these recipes after the feast day (or almost after). I wanted to get pictures before I posted them. I think you'll find, however, that these dishes would be wonderful for any feast of our Blessed Mother. When I planned my menu for the feast of Our Lady of Lourdes, I decided to prepare the roasted chicken and cauliflower, simply because of their French origins. But when I pulled the whole menu together, I realized I had the makings of a white meal. I normally try to plan my menu for each dinner with colorful foods -- a green or yellow vegetable, maybe an orange or red fruit, a white or red meat and maybe a green salad. This meal, however, was almost devoid of all color, representing our Blessed Mother's immaculate conception, which she declared to St. Bernadette at Lourdes. I am not posting my recipe for mashed potatoes, or French bread, since I imagine you already know how to make mashed potatoes and possibly have a recipe for French bread. You can find my French bread recipe here. I didn't manage to get the cake made, mostly because there was mass clamoring in my house for chocolate chip cookies, but I often make this cake for Mary's feast days. You could also make these pretty French cookies. With their rosette appearance, they make a perfect Mary cookie. (this allows them to cook more quickly). Rinse and pat dry chicken pieces and place in a large bowl. Add lemons and garlic cloves to bowl, squeezing each lemon piece slightly. Sprinkle with oregano and drizzle with 3 T. olive oil. olive oil and smear with your hands. arranging so pieces don't touch. on top of chicken pieces randomly. Test for doneness and serve when juices run clear. and smear with your hands. Place onion, garlic, and cauliflower in a large bowl. Drizzle with 2 t. olive oil. Mix mustard and water and pour over vegetables. Place on baking sheet and spread out. Add milk, shortening and 1-1/2 t. vanilla. Pour batter into greased and floured 13”x9” pan. Bake at 350 degrees for 20-25 minutes, until cake tests done with a toothpick. Cook over low heat until butter is golden brown. 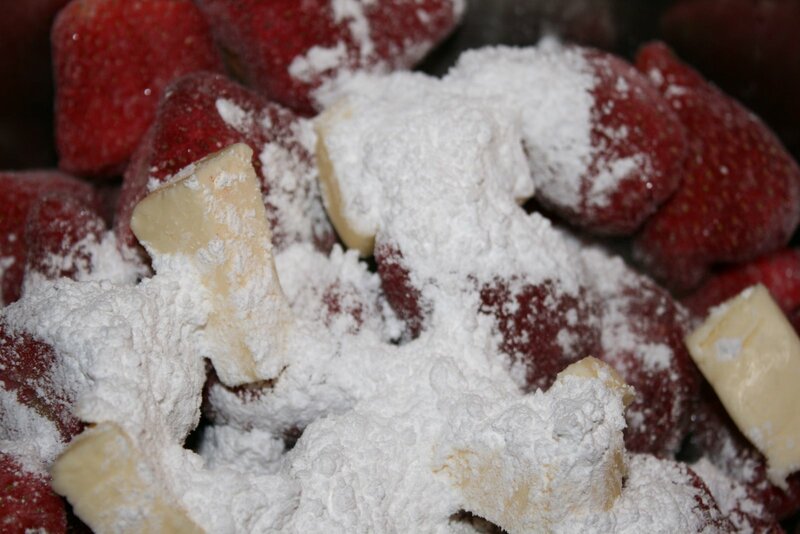 Remove from heat and add powdered sugar, half & half, water and vanilla. Beat with a whisk for 3 minutes, or until smooth. Use four squares for the back wall of the grotto and one square cut in half for the floor. Build up the walls with all but four of the remaining squares. Mold three squares into the roof and cut the last square in half to add to the sides of the roof. You may need to play around with it a little bit and trim the edges if you'd like. Our Lady of Lourdes ~ Pray for us!! An easy way to celebrate any of the Blessed Virgin Mary's feast days is by incorporating the colors that symbolize her into our meals for that day. 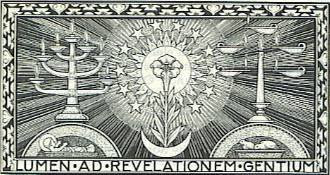 The color white symbolizes Mary's purity and blue is the traditional color of her mantle and/or sash. 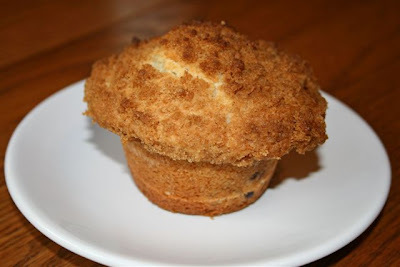 These muffins would also be great for any Saturday morning breakfast, since Saturdays are devoted to Mary. I prefer increasing the blueberries to 3 cups, though I didn't have enough in my freezer for our latest batch. They were missed! Preheat oven to 400 degrees F (200 degrees C). Spray muffin pan with Pam or other non-stick spray or line with muffin liners. Combine flour, sugar, salt and baking powder in large bowl. In a 2 cup measuring cup, place vegetable oil, eggs, vanilla, and enough milk (just over 2/3 cups) to fill to the 2 cup mark. Mix this with flour mixture. Fold in blueberries. (Note: The batter is extremely thick.) Fill muffin cups right to the top for oversized muffins. To make the crumb topping: mix together 2/3 cup brown sugar, 1/4 cup flour, 3 Tbs butter, and 1/2 teaspoons cinnamon. Mix with a fork, and sprinkle over muffins before baking. This recipes yields approximately 12-16 extra generously sized delicious muffins. Our Lady of Lourdes ~ Pray for Us! Napkins, a functional part of every meal, can be folded into fanciful forms to become a joyful addition to your table and feast day meal. There are numerous napkin folding styles that could be used to represent symbols of saints or liturgical seasons. Especially for those days when you don’t have the time to prepare any feast oriented foods to serve, this can be an easy and appealing way to dress up the feast day table. Folding napkins need not be a time consuming chore, but a quick and enjoyable experience with dramatic results. It’s a great hands-on project for the children. When getting started it's helpful to know that cotton and linen napkins hold a better crease. Polyester blends require less care but do not hold a crease well. Pictured here are the “Candlestick” or “Candle” style on the left, and Nightlight” on the right. 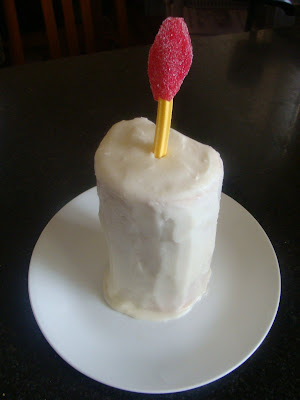 You can link to a tutorial of the “Candlestick” here and “Nightlight” here. This idea – which, for lack of a better description, I have been referring to as liturgical napkin folding, holds much promise . 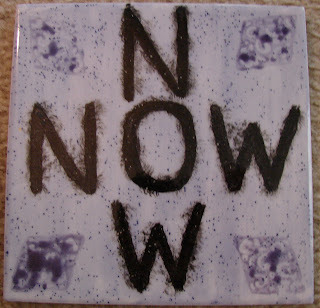 There are so many ideas and there is much that could be done with it if you are so inclined. Even if there is not a particular shape we can fold to fit the feast day as a symbol, there are many folds that will enclose a favor that can be used to tuck a holy card, or flower, or other seasonal token inside to remind us of the focus of the feast day. Another simple idea like varying the napkin colors, even if not folded at all, can tie in the liturgical seasons - Purple in Advent and Lent, Red for Pentecost, the Passion, or Martyrs’ feasts, White (or Gold) for the feast of Our Lord, Blue (or White) to honor Our Lady’s feasts, Green in Ordinary Time. You can also stick to simple folds or rolled napkins and dress those up with napkin rings that tie into the feasts and seasons. I have lots of ideas and will be sharing those with you in upcoming posts. 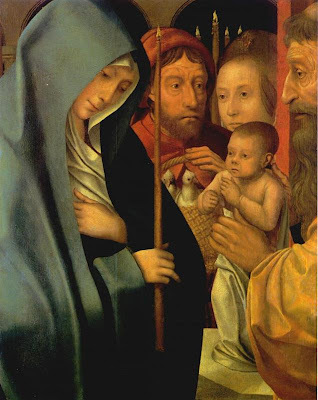 ****And I know I am posting this late this afternoon, so if you don’t see this in time for Candlemas don’t fret, the candle napkins would be perfect again tomorrow, February 3, for the feast of St. Blase. The candle blessing -- one of the three principle blessings of the liturgical year, the others being the blessing of palms and ashes -- will be given by the priest wearing a purple cope. He will pray 5 prayers over the candles placed near the Altar. The candles are sprinkled three times while the Aspérges me is sung, and then they are incensed and distributed. When we take a blessed candle from the priest's hand, we kiss the candle and then the priest's hand, just as we do on Palm Sunday when we kiss the palm and then the priest's hand when receiving the blessed palms. 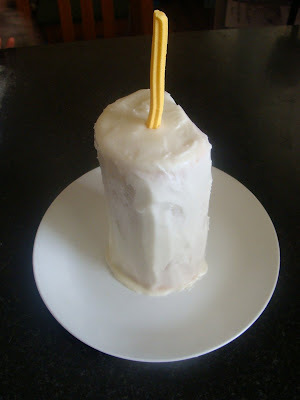 I've just posted our Candlemas craft activity, the idea orginally coming from Charlotte at Waltzing Matilda. for anyone looking for a craft and a recipe. In typical fashion, I've wanted something easy but eye-catching for the children, so this is what I've come up with. I bought a jam and cream sponge roll. Placed it vertically on the plate. I bought a fruit stick and stuck it in on the top. Some red candy strap...folded over and using sissors, cut into the shape of a flame. The strap is folded over the stick and pinched together on the sides. All done! Very simple and fuss free. My youngest child's baptismal day is Candlemas, so this cake is for her!